The leading independent specialist for windscreen replacement and windscreen repair based in Chesterfield and serving all of the Chesterfield area. National Windscreens Chesterfield fitting centre provides windscreen replacement and windscreen repair services to businesses and individuals throughout Chesterfield and the Chesterfield area. 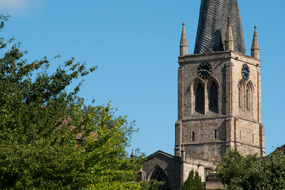 Chesterfield sits on the A619, A61 and A617 which all provide access to the city and the surrounding area. In addition, Chesterfield is located close to the M1 which provides access to Sheffield and Rotherham in the north and Nottingham in the south. The town is a traditional market town in the county of Derbyshire and lies 24 miles north of Derby. It is home to Chesterfield Football Club who play their home matches at Proact Stadium and is located in the tourist hotspot of the Peak District. The Chesterfield windscreen fitting centre and its mobile vehicle glass technicians service the needs of Chesterfield and the surrounding area including Matlock, Dronfield, Buxton and Mansfield. With 108 fitting centres and over 800 mobile technicians, National Windscreens operates the UK's largest windscreen repair and windscreen replacement network. The company provides low cost, high quality windscreen replacement and windscreen repair from its Chesterfield fitting centre 24 hours a day, 7 days a week, 365 days a year. Repair and replacement of all types of vehicle glass including windscreens, rear windows and side windows is undertaken throughout Chesterfield and all of the Chesterfield area.